With a route inspired by the Victoria Gran Fondo's 266km yearly epic, Clay and I set out this past Sunday for what was to be a full day of getting rad on road bikes. Totals: About 275km on the road, just shy of 12 hours total travel, somewhere near 10 hours of riding time. The first leg of the ride came easy, routed along Highway 14 with Clay pummelling every hill between Langford and the outskirts of Sooke. Steady pacelining and no wind made the kilometres tick by. We stopped for much needed coffee from Sooke's excellent Stick In The Mud coffee shop, before heading along the coast. 70 km from Sooke to Port Renfrew provides some of the most stunning, and traffic-free roads the lower Island has to offer. Sunday was no different, though at the usual turn-around point of Jordan River we instead stopped for cold Coke, and to rest before the climbing really began. After working our way up about 1000 ft in elevation, a blistering descent into Port Renfrew concluded section number two of the ride. Port Renfrew. Burgers and caeser salad, with sugary baked goods to complement, were consumed as we charted out the following kms. At this point, it should be pointed out that Port Renfrew was our planned 'bail-out' spot. If we felt like punking, we had planned on turning back here, and only completing a 220km ride. 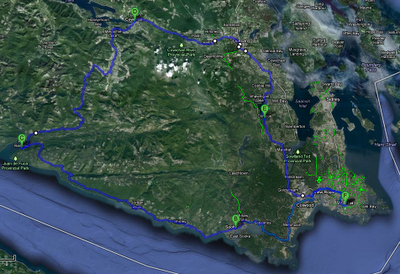 Poor planning like this does a lot to galvanize one's spirits, and so we set out for Cowichan Lake. The first 30 minutes of riding runs along the valley bottom, with wide roads and lush marsh on either side. Soon a few ramps ascend, each levelling out to flat, as the road deteriorates a bit, and the snow banks grow in size. The clear cuts begin in earnest, and so does the climbing, culminating with hairpin switchbacks that throw you up on to an alpine pass. After circumventing the peak, the road steadily drops towards Cowichan, allowing time to be made up and scenery admired. 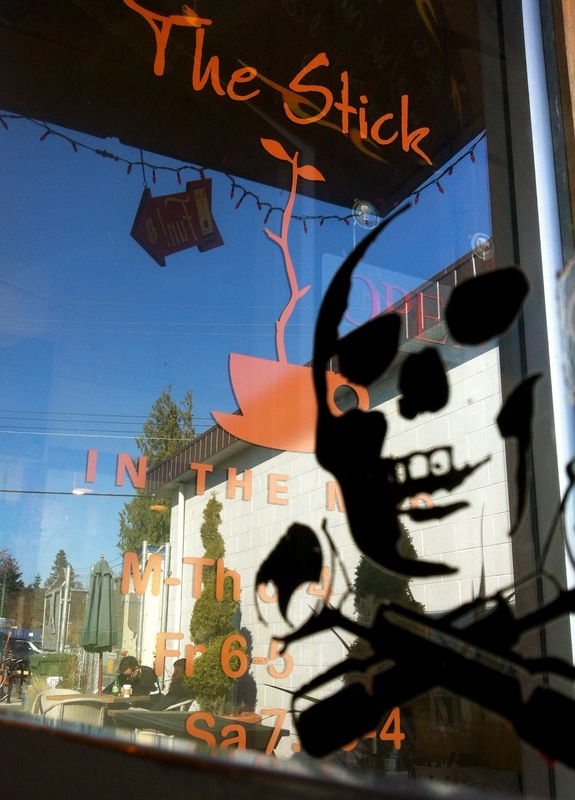 By the time we hit Cowichan, fatigue was making itself known. More sugar, more snacks, and Clay brought us downhill to Duncan via the little-used Cowichan Lake Road. The road from Duncan to Cobble Hill is a bit of a blur, but I think we hit the highway, and I'm pretty sure that I was feeling good. I remember time-trialing along the shoulder, and vomiting simultaneously. Shawnigan Lake was the site of our only flat, timed just close enough to sunset to make descending the Malahat after dark an unwelcome possibility. Our '15 minute' climb out of Shawnigan was the last long grind of the day, leading on to the ripper descent down the Malahat just as night fell. Clay and I hit the Goose back to town and reached home in the dark feeling like Badasses. Riding out of Goldstream just as the sun sets. Solid early season effort. Chapeau!